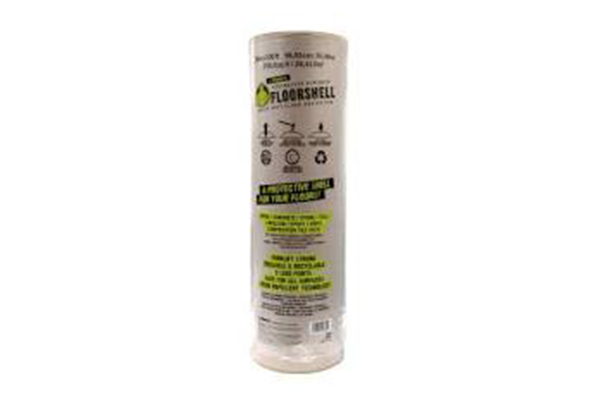 FloorShell is a contractor strength floor protection roll for your toughest jobs. Heavy duty construction board made from 100% recycled fibers, this item is eco-friendly and reusable. FloorShell protects wood, concrete, stone, tile, linoleum, epoxy, vinyl composition tile (vct), and most other floor types. The 45mm thick board can even stand up against the wear and tear of forklifts. Worried about spills? Our new innovative Spill Block™ liquid repellent technology protects against paint, mud, water and more. Our scored edge provides protection for baseboards, walls, and can even be used to contain debris to the aisle. 45 mm thickness – forklift strong!